Dziga Vertov (David Kaufman, 1896 – 1954) is famous for his radical fresh approach to the documentary cinema. His Man with a Movie Camera and Kino Eye became true classic of the Soviet silence avant-garde of 1920s. However, he managed to try himself as an animator, too. 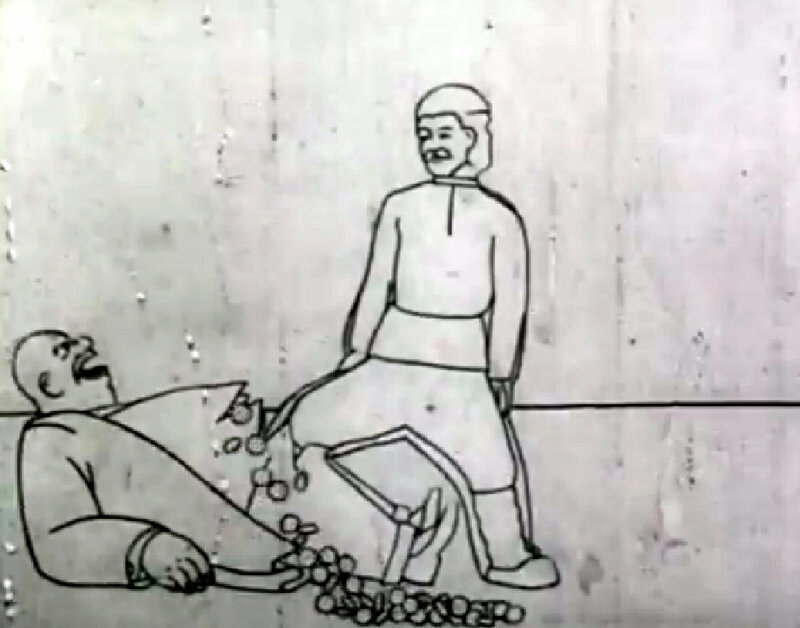 In 1924 he directed one of the earliest Soviet animation Soviet Toys. 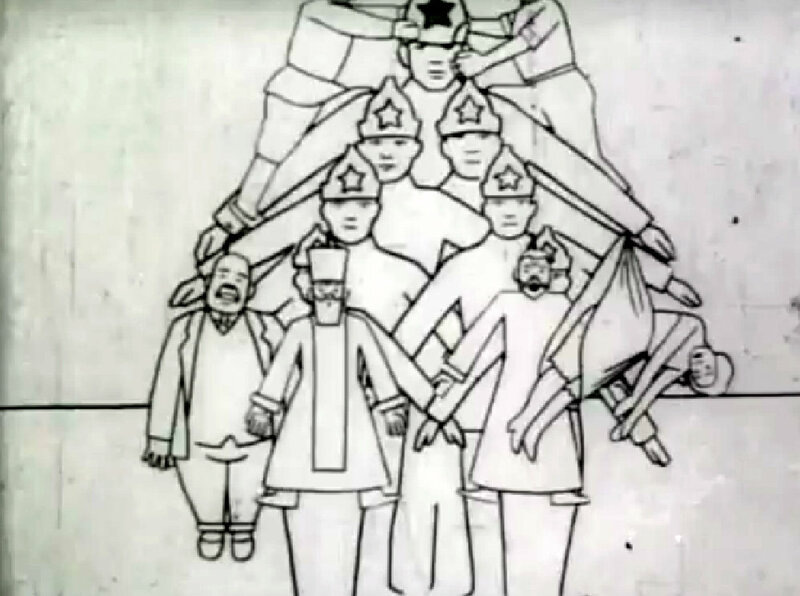 Like many works of Vertov, this animation short is a heavily propagandistic piece of art aimed at NEPman, a member of a new wealthy social class of the 1920s. NEP (New Economic Policy) was born in the result of the temporary liberalization of the Soviet economy in the 1920s. This cartoon also aims at the Russian Orthodox Church that was suppressed during the 1920s-1930s particularly harshly although a caricature depiction of the fat corrupt priest was not atypical even for the pre-revolutionary Russia. The other priest is a satirical representation of the so-called Living Church (обновленцы) that was established in 1922 during the schism within the Orthodox church. NEP helped to recover post-Civil War Russia, but was often criticized as a return of the capitalist past particularly by the left-wing activists and avant-garde artists like Vertov who promoted building of the new Communist society. NEP lasted for less than a decade, until Stalin became an ultimate Soviet leader in 1928. Vertov rather accurately predicted the decline of NEP: after the worker and peasant (literally) unite they manage to crush NEPman and take all his money. Soviet toys ends with the scene of the Christmas tree composed of the Red Army soldiers who literally hang fat NEPman, his girlfriend, both priest, and the worker and peasant climb to the top of the new social order. As Lenin stated, the capitalist will sell us rope with which we will hang them. After NEP helped to recover the state of economy, it was prohibited and private entrepreneurs were forced to close their businesses. Vertov was interested in exploring various media and employed animation technique in some of his documentaries, including stop motion sequence in his famous Man with a Movie Camera (Человек с киноаппаратом), 1929. Though roughly made, Soviet Toys is one of the important artifacts of the dawn of the Soviet animation.